Corallus hortulanus is well known for its highly variable color and patterns. They have small, claw-like remnants of vestigial hindlimbs in the cloacal region. Their base color varies from pale tan to black, with yellowish and reddish tinges. Corallus hortulanus are marked by a series of blotches or bands that are often broader in the mid dorsal area. The head has five dark stripes that extend from the eyes. The venter color is also variable, from cream to reddish brown, and either with or without darker markings. The eyes can be yellowish, grayish, or reddish, and they have a reflective membrane that results in eyeshine at night. There will not always be necessary to go through all sizes maintenance; it will depend on the individual to occupy, often resulting in a state of stress if the container is too large for a small size specimen. To avoid such a situation it is advisable to put plants in the enclosure for shelter, and even not use lighting in the new terrarium for a period of 72 hours will help their adaptation. 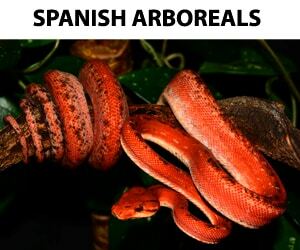 These snakes tend to use plants and hollow branches for shelter, so it’s advisable to have a leafy plant in their terrariums as a natural refuge to avoid spending long periods of time on the floor of the terrarium trying to shelter. As a substrate for these arboreal boids there are many options on the market today. We recommend natural beddings as fir bark or coconut bark. In all cases we must keep in mind that they are not irritating or abrasive products and be careful about the possibilities of parasites proliferate on it. When we are thinking about lighting for our amazon´s terrariums, do not worry too much, the percentage of light radiation that use these boids is very small, so a system of common cold white light will be sufficient to provide the photoperiod necessary. Unless we have introduced tropical plants that require other features, fact for which we worry about the needs of the plant or plants in question. However, the heating is one of the most important parameters, being so dangerous provide an excessive temperature drops as allowing accused of it. It is necessary to consider the Amazonian origin of the species and its condition arboreal to make the decision on the heating element and its location in the terrarium, it is appropriate to place said radiating element (panel or incandescent bulb is the most effective) in the top of the room, leaving the hortulanus sit on top while sunning or win the temperature required for proper digestion, leaving the rest of the terrarium lose temperature and thus get a soft but noticeable temperature gradient for thermoregulation at will our boa. The temperatures recommended for these Corallus range from 30 to 31 °C (86-88 °F) day and night 25 to 26 ° C (77-79 °F) during the warm months of the year, from mid-February to mid-September, in periods of 12 hours for each cycle, and 30 to 31 °C (86-88 °F) day and 23 to 24 °C (73-75 °F)night in the cold months, when cycles will reduce to 6 or 8 hours of day and 16 or 18 hours at night. They are not animals who drink too much or too often, but it is important to always have fresh water in a container where they can get the whole body, this will help them to drink when they are thirsty and give a bath in order to thermoregulation. The daily terrarium spraying also will help them to be hydrated. Considering that the hortulanus come from rainforest we understand that provide moisture should be high, always ensuring proper ventilation not offer facilities for bacteria and fungi proliferation. It is advisable terrarium spraying once or twice a day, bringing the moisture content to almost 100% saturation, and letting down gradually around 60%. Despite being a boa and so eager and greedy to feed, as is typical in this genre, we take care of the prey size and frequency of its offer. To keep high food pace with our Corallus hortulanus we must be very sure of their acceptance and metabolic rate because they are prone to regurgitation, with the alteration of the upper respiratory tract which is the vomit of a dam half-digested and the resulting possibility of bacterial infection. It is recommended to provide food once a week to new offspring in full development (babies and yearlings), for a faster metabolism, and once every ten or fifteen days to adult specimens. Always adjust the rodent height to the size of the snake. This section should be cautious with preys whose metabolism is prone to large reserves of fat and protein as hamsters or rats, are not always recommended for our tree boas. While these snakes are not easy to handle because of his impetuous character, the difficulty will depend largely on each individual, some are more lenient than others when it comes to physical interaction, having cases that seem almost unchanged on pickup and other where you have to wear gloves and herpetology hooks to handle them. Normally, if we are patient and appellants in their care, they will eventually accept our approach without being subject to attack each approach. Cleanliness is another important parameter in maintaining our Amazon tree boas. Fortunately we have today a wide range of cleaning products compatible with our animals, so it is desirable to try to be consistent in cleaning the terrarium. Keep in mind that some parasitism or health problems in our snakes may result from inadequate cleaning. Like other species of snakes, Corallus hortulanus shed depending on the receiving feed and frequency with which we feed. When they are babies in fully developed and receive more frequent feeding will be shedding every 30-45 days normally, reaching to between 8 and 10 sheds in the first year. As they become adults and spaced feeds to reach its maximum size, also they will decrease the rate of sheds and can make 3 or 4 sheds per year in total. No notable health problems may be associated as characteristic of the Corallus hortulanus, but are known cases of problems related to the upper respiratory tract and immunosuppression resulting from stress. 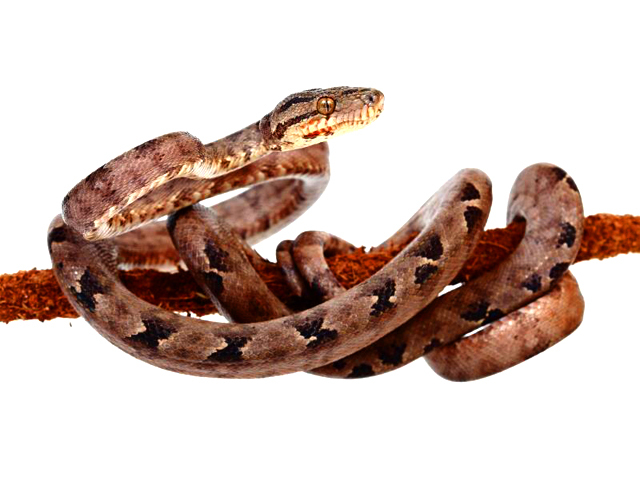 In most cases they are diseases that can be avoided by making quarantine to specimens of new acquisition and taking good parameters in the maintenance of these boas.